Jakarta (20/6), It is with great pride to announce that Multimatics is now officially an ATO-Affiliate of Quint Wellington Redwood, the Global ATO (Authorized Training Organization) of APMG International, the Official Examination Institute appointed by AXELOS, the product owner and accreditor of ITIL®, PRINCE2® and Management of Risk® certification programs. This great news enable Multimatics’ clients to obtain the official training not only on ITIL®, PRINCE2® and Management of Risk® but also the COBIT5® and ISO/IEC27001 full training and certification using Quint Wellington Redwood accredited materials that are up-to-date and practical. Through Multimatics, our clients are now able to learn from APMG Accredited Trainers, both locally and internationally experienced that has gone through stringent and rigorous assessments to ensure quality delivery. 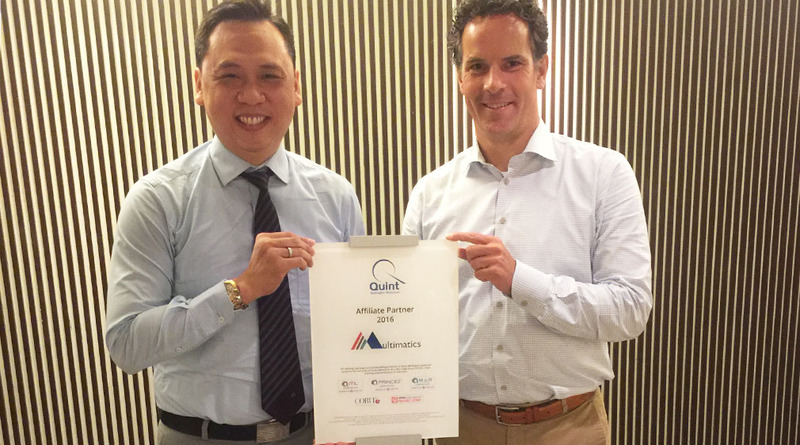 In 2015, Multimatics received a Certificate of Appreciation from Quint as the Highest Revenue Growth of Indonesia in contribution for Quint Wellington Redwood. This is one way of Multimatics’ commitment in escalating and enhancing IT resources in Indonesia through collaborating with Quint Wellington Redwood. May with this affiliation and authorization, Multimatics will be the best and trusted training provider in Indonesia, guiding and helping Indonesia’s resources towards a better development and enhancement in various professional fields. ITIL®, PRINCE2® and M_o_R® are registered trade mark of AXELOS Limited. PT Lifelong Learning is a Licensed Affiliate Partner of Quint Wellington Redwood to deliver the full suite of ITIL®, PRINCE2®, M_o_R®, COBIT5®and ISO/IEC27001® training and certification in Indonesia.